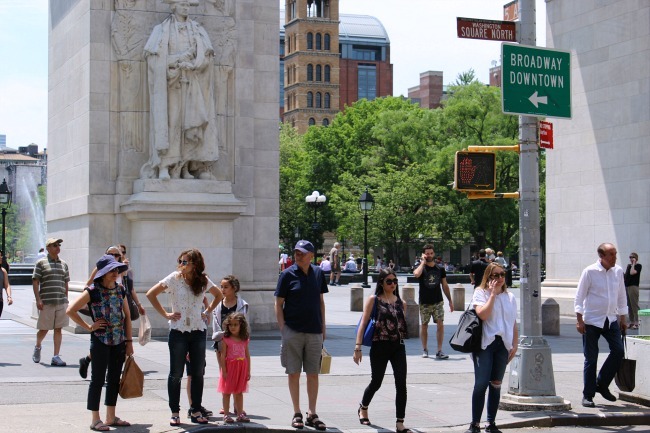 As I shared in my previous post, I decided before going on my recent trip to New York City that I would spend most of the day in Lower Manhattan. So once my bus arrived, leaving us at 7th Avenue and 27th Street, I began walking. As you all know (especially, Val, my New York City walking buddy) that whenever I go to the Big Apple, I love to walk everywhere. Very rarely will I take public transportation because my greatest joy about being in a city like New York is that I can walk for hours and hours, and yet never notice how far I've walked because there is so much to look at and enjoy. On the average, I walk 80-85 blocks whenever I visit Manhattan - and that is over a 9-hour day. 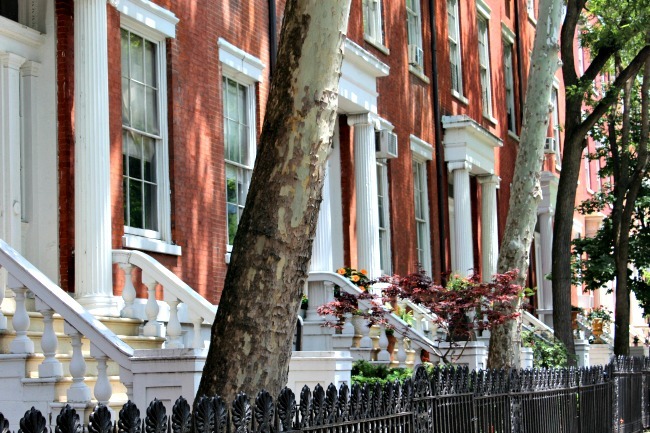 Last Wednesday while I was in the city, the weather was drop-dead gorgeous. It was sunny, breezy, and only slightly humid; therefore it was the perfect condition for walking. One of my rituals upon departing the bus in NYC is to run into a nearby Starbucks to use their restroom because I usually have to pee like a Russian racehorse after the hour and a half ride. My second ritual is to immediately eat something because I'm usually starved by the time I get there. This trip however, I spontaneously decided to walk down to the Village and then find a place to eat lunch, which I'm so glad I did because I ended up walking directly into Washington Square Park. 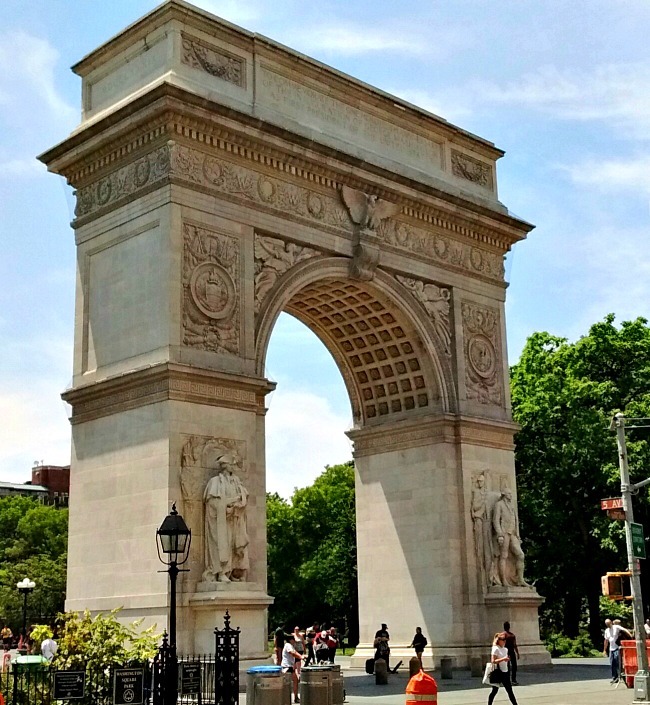 And when I first spotted the infamous Washington Square Arch, I got so excited because I haven't see it since the 1970's-80's, when I lived in New York. So do you know what I did? I grabbed a sandwich and chips from a deli and then walked into Washington Square Park, where I sat on a bench and ate my lunch while I people-watched. Oh, and I also fed part of my sandwich to the park squirrels. After lunch, I took out my camera and photographed the arch and surrounding area. 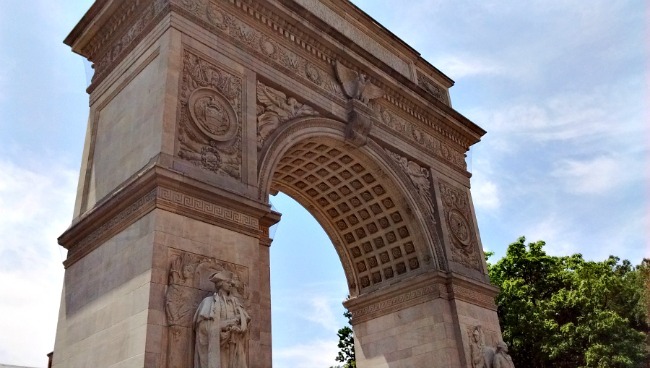 And as I was snapping away, I suddenly remembered that my favorite romantic comedy film, When Harry Met Sally, was partially shot at the Washington Square Arch. If any of you are fans of the film, I think you'll remember the scene. It's when Harry and Sally first arrive in New York City after sharing a ride from Chicago together. Sally: Well, have a nice life. What a fun post, Ron! When Harry Met Sally is one of my favorite romantic comedy movies too, so I do remember the scene. I'm such a movie and star struck person that I would have been in awe to be in the exact location of the film. 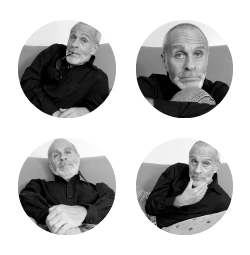 Great photographs! You can see how beautiful the day was from your pictures. I love it when photos actually come to life. Beautifully framed. I love yhe shot with the yree branches. The arch is an exquisite architectural beauty. Wonderful captures. Lovely shots of the arch - reminds me of the Arc de Triomphe in France... And what a gorgeous terracotta colour those houses are. Have a great weekend! Love the arch and studied it but I wish I could determine what it is right at the top.... it looks a bit like a butterfly. Could you enlighten me, please? Further down was the picture of the apartments which I really liked. I am pleased you had such a good day - which we benefited from. PS I never saw that film, duh! Oh Ron, the twin towers standing inside the arch . . . So sad to see now. But I love that you went back in time and found those still shots of the movie. The arch and the park are beautiful, aren't they? I was there on my last trip to the city, when I chaperoned the school choir trip. We were supposed to meet up at the arch for a group photo, after sightseeing on our own. My group never made it for the photo, as we were having too much fun in Little Italy. The pizza and gelato were worth it! "I'm such a movie and star struck person that I would have been in awe to be in the exact location of the film." Ha! I'm the same way, Candice. That's why realizing they had shot that scene in this location, got me all excited. Yes, it was a beautiful day, couldn't have been better. Thanks so much for stopping by, my friend. Have a grrrrreat weekend! Me too, Lisa. That's why I enjoy taking photographs with people in them because it gives the images "life." And NY, being a city with so many people...there is always so much movement and life. Yes....you are absolutely right, Fiona! It does look very much like the Arc de Triomphe in France. In fact, it looks almost identical! That's a "eagle" at the top. But you're right, it does kind of look like a butterfly! It's funny because in all the time I lived in NYC and passed by the Washington Square Arch, I never noticed those beautiful apartments. Aren't they beautiful? Thanks so much for stopping by, dear lady. Have a gorgeous weekend! P.S. 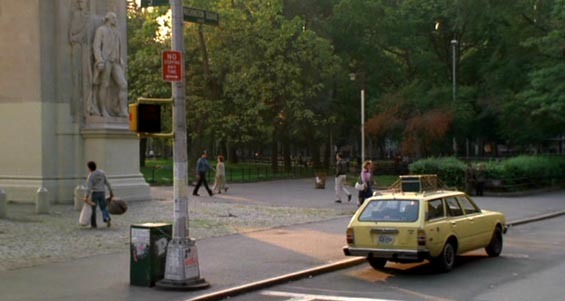 When Harry Met Sally was a film written by Nora Ephron and directed by Rob Reiner. It was initially released back in 1989. FAAAAAABULOUS film.
" the twin towers standing inside the arch . . . So sad to see now"
Yes Bijoux, I thought the same thing when I saw that picture with the Twin Towers in the background. How sad to see it now without them. In fact, several months ago I was watching the DVD movie, Moonstruck, and one of the scenes had the towers in the background as well. "I was there on my last trip to the city, when I chaperoned the school choir trip. " OMG.....that's AWESOME! And yes, the park and arch are sooooooooo beautiful! And speaking of Little Italy, I went there many years ago when I was visiting NYC with a Florida friend. We were fortunate enough to be there in Sept. during the Feast of San Gennaro. The food was amazing! Ron, do you realize those 85 city blocks translate to 4.25 miles?? That's a LOT of walking, my friend -- good thing you peed first, ha!! I've always loved Meg Ryan, and your shots of the arch are even better than those from the movie! What a lovely place to grab a quick lunch and watch people. Funny, though, how some of these folks look just like folks you'd see practically anywhere! Great post, Ron, and great photos, as always! 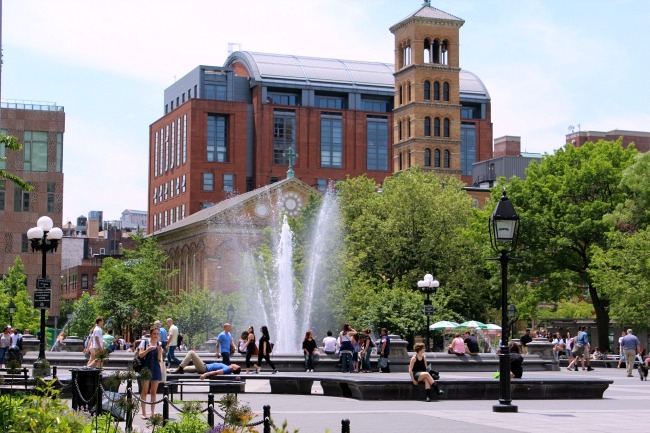 I love Washington Square Park on a warm, sunny day, and eating lunch there is my idea of paradise. Nice clips of the flick, too! I swear, nobody does New York like you, buddy! Have a great weekend! The weather that day was PER-FECT! "do you realize those 85 city blocks translate to 4.25 miles?? That's a LOT of walking, my friend -- good thing you peed first, ha!!" HAHAHAHAHAHA! That is so funny! And OMG...I had no idea that 85 blocks equaled 4.25 miles?!?!? Me too, I have always loved Meg Ryan and all her films. She a Billy Crystal make the perfect couple in this film, don't they? What a brilliant film! The weather that day was absolutely perfect, so it made my visit even more delightful! "Funny, though, how some of these folks look just like folks you'd see practically anywhere!" You're right, people are pretty much the same everywhere. Thanks so much for stopping by, my friend. Have a happy weekend! Ron, being someone who is originally from New York, I agree with Rob, nobody does New York like you. Anytime you post about the city, it makes me miss my hometown. You should be living there because you're NY's greatest advocate! I haven't seen Washington Square Park in so many years. Your gorgeous pictures make it come alive for me. And I love the pictures of When Harry Met Harry in comparison to yours. That is so clever. Love that movie! Beautiful photographs, Ron! That arch is amazing! I love the second picture down because it shows the incredible detail in the architecture. Your love of New York shines through your posts. I can feel your passion in every word. You always make me want to visit because you make it sound and look so appealing. Glad you were able to visit your favorite city during your time off, dude! Thank you :) Being the creative person you are, I think you would really enjoy visiting NYC. I understand that not everyone could live there because it's extreme in many ways. However, it's a city that continually inspires me. New York has always felt very close to my heart. Thank you for your sweet words :) From the very first time I visited NYC, when I was only 14 years old, it has always been a place that felt close to my heart. And even though I wasn't born there, I feel as if I was. Yes, I have a feeling that I will be living there again! Don't ya just love the movie, When Harry Met Sally? I own the DVD and watch it many times throughout the year. Yes, I will definitely say hello t New York for you, the next time I'm there. In fact, I may be going there again soon. Ron, your photographs of the arch are beautiful. The third one down is just stunning because you are able to see the detail and how grandiose it is! Seeing the Twin Towers in the film photo made me melancholy for a time that once was, although I love that movie! It still makes me sad whenever I see a film or TV show where the towers once stood, but no longer. God, it's been ages since my husband and I have been back to visit that area of NYC. When we were still living on Long Island we would go into the city quite often to catch a matinee show and have dinner, and then drive back. I hope you have more photographs and stories to share about your trip to New York. P.S. Can you believe how hot and humid it got today?
" Seeing the Twin Towers in the film photo made me melancholy for a time that once was, although I love that movie! It still makes me sad whenever I see a film or TV show where the towers once stood, but no longer." It made me feel the same way when I spotted that photograph. The Twin Towers were such a strong landmark of New York City, that being reminded of them in a picture or movie makes me melancholy as well. "When we were still living on Long Island we would go into the city quite often to catch a matinee show and have dinner, and then drive back." That's wonderful! My roommate in NYC was born on Long Island, so his parent would often drive into Manhattan and take us to dinner on a weekend. Yes, I have more stories and photos of my recent trip which I'll be sharing later. Thanks so much for stopping by, neighbor. Have a terrific weekend! P.S. OMG...the heat and humidity today was horrendous!! It's supposed to rain tonight and cool things off by tomorrow, thank god! Thanks so for stopping by to let me know, my friend. Hope you're having a super Sunday! Oh, how I love the Washington arch! And When Harry Met Sally. I know I've mentioned my fondness for that movie in previous posts - it's been a New Year's tradition for a long time now. I'd love to see it in person! As always, excellent pics. I'm so glad you broke down and got your smart phone, because I especially enjoy following you on Instagram, too. Have a great week, my friend! Mark, yes, I knew that you too are a HUGE fan of When Harry Met Sally, so I was thinking of you while I was there. 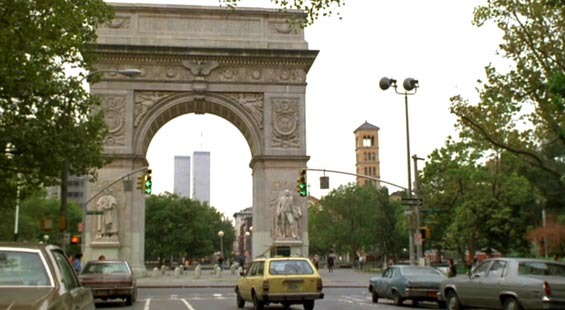 And also knew that you would definitely remember that scene in front of Washington Square Arch. It's funny because about two days after I came back from my last trip to NYC, I decided to watch my DVD of the movie. Aw, thank you, buddy. I too am glad I FINALLY broke down and got a Smartphone. Although it's been more work for me to take pictures because now whenever I go out and take photographs, I use both my Smartphone AND my Canon; going back and forth. Thanks so much for stopping by! Have a super week, my friend! P.S. I enjoy following you on Instagram as well! Ron, what a great post! I just LOVE the pics. It's been a few years since I've been to NYC and I do miss it. It's such a beautiful city, with as you said, lots to see and do! And I too like to walk (and I run into a Starbucks for my latte and a quick pee first!). One thing I haven't done in all these years is see a Broadway show! That's insane! I've been talking with my oldest son about he and me going for a few days. He love NYC too. Thank you :) Whenever I go to NYC, I'm always inspired to take a ton of photographs. I took about 125 pics on my last trip. It's been ages since I've seen a Broadway show as well. I think the last one I saw was back in the 1980's!!!
" I've been talking with my oldest son about he and me going for a few days. He love NYC too." Oh, what a great idea! And if you do go, I bet you'll have so much fun! One of the most wonderful things about going to NYC is that I feel so creative and energized when I come home. NYC inspires me. My younger brother is coming to visit me in Philly in the Fall, and we are going to spend two days in NYC as well. He's never been to NYC in his life. Thanks so much for stopping by, my friend. Have a fantabulous week as well! Thank you :) Whenever I go into NYC, I am always inspired to take photographs. I took about 125 this last trip. I may be going again next month. Don't ya just LOVE, When Harry Met Sally? It truly is one of my FAVES. It always puts me in a good mood. I agree...it's sad what Meg Ryan did to her appearance. WAY too much plastic surgery. Yes, NYC is not at all far from Philadelphia. I just hop on the bus and I'm there in no time. 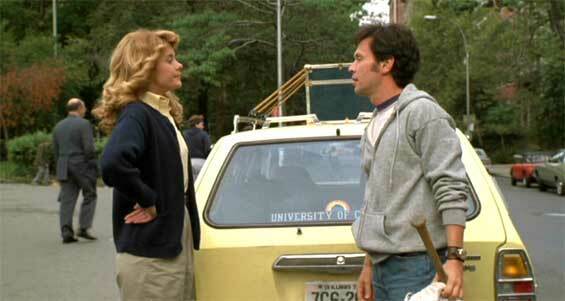 Ron, I just wanted you to know that because of this post, I got the urge last weekend to watch "When Harry Met Sally!" 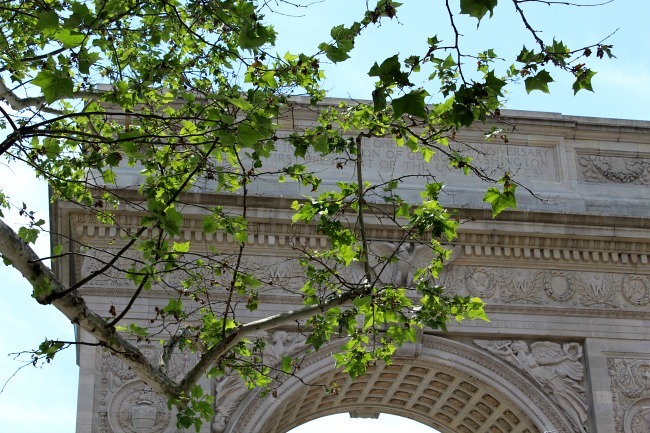 And I thought of you when I watched that scene at the Washington Square Arch. How wonderful it was to see that film again! Oh how FABULOUS! And do you know what? I also watched the film this weekend, Denise! I watched it Saturday night. I never get tired of seeing that film! Oh cool! I have to admit, I lobed that movie and remember that scene well. You really do get the most out of your walks and always come back with wonderful photos. Another great job! And don't ya just love that movie?